Thallus: foliose, up to 2 cm in diam., often +irregular to somewhat orbicular lobes: elongate and discrete to somewhat irregularly rounded and partly imbricate, mostly 0.2-0.5(-1) mm broad, usually +flat to irregularly concave, prostrate upper surface: usually gray-brown or brown (rarely pale gray), epruinose and without distinctive epinecral layer; lobe ends: usually with sparse to abundant, tiny cortical hairs, 10-15(-25) µm long and one cell wide; sorediate/isidiate soredia: granular or sometimes becoming pseudocorticate and isidioid, in primarily marginal, irregular soralia which are elongate, sometimes becoming reflexed and even (esp. in southwestern material) weakly labriform upper cortex: paraplectenchymatous medulla: white lower cortex: paraplectenchymatous lower surface: pale tan +throughout, dull; rhizines: simple, +concolorous with the lower surface Apothecia: infrequent, up to 2 mm in diam., sessile; margin: usually entire, occasionally sparsely lobulate ascospores: narrowly ellipsoid, (15.5-)18-22.5 x 5.5-8 µm, Physcia-type Spot tests: all negative in cortex and medulla Secondary metabolites: none detected. Substrate and ecology: on bark or less often on rock World distribution: North America and Europe Sonoran distribution: Arizona, Baja California, and Baja California Sur, at 700-2300m. 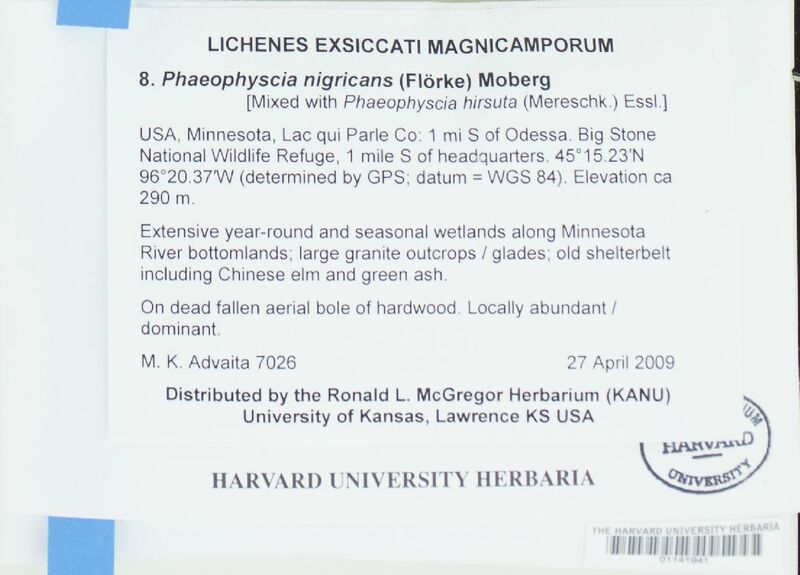 Notes: As pointed out by Moberg (1977), Phaeophyscia nigricans is an extremely variable species. Narrow lobed specimens with sparse, strongly isidioid propagules at first seem to have little in common with the more round-lobed specimens with soredia in almost continuous marginal soralia. However, these extreme forms intergrade continuously, and any consistent distinction becomes impossible to recognize. This small, usually distinctly brownish species can usually be distinguished by its pale, paraplectenchymatous lower cortex. In the Sonoran region, two easily confused species occur: (1) Physciella chloantha, an equally variable species, is sometimes browned and can be very similar to the rounder-lobed specimens of Phaeophyscia nigricans, and at times can be distinguished with certainty only by the prosoplectenchymatous lower cortex, and (2) Phaeophyscia hirsuta, usually with distinctly multicellular cortical hairs, is sometimes very brown and with only few or broken hairs, but usually its distinctly darkened lower surface will distinguish it from P. nigricans. Neither of these superficially similar species has the distinctive tiny (one cell wide) cortical hairs characteristic of the lobe ends (and occasionally the isidioid soredia) of P. nigricans. I have not seen these microhairs (visible with high magnification dissecting microscope [c. 40x]) mentioned before in the literature, although they are present too in the European specimens.